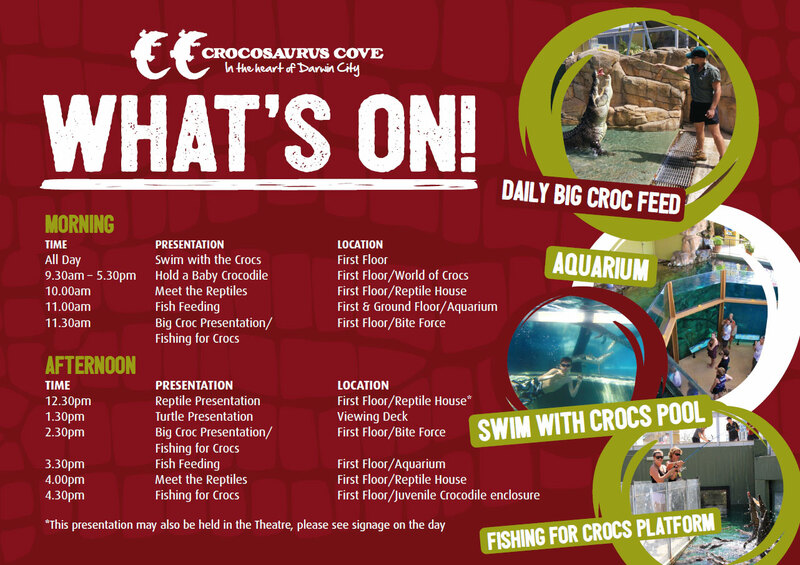 With 9 reptile shows daily, Crocosuaurus Cove allows its visitors to get up close to some of the Northern Territory’s famous inhabitants. The shows at Crocosaurus Cove are designed to be both informative and interactive. Guests are encouraged to hold some of the friendly critters in our reptile shows including Blue tongue lizards, olive pythons and Western bearded dragons. Visitors can hold a baby crocodile throughout the day in the World of Crocodiles museum. Amazing photographs can be purchased here of your unique Northern Territory encounter. Watch the Barramundi get fed in our 200,000 litre fresh water aquarium and don’t forget to meet the Turtles of the Top End in our top floor Turtle Billabong. Watch the Big Crocs being feed every day by our brave crocodile handlers and get close to the juvenile crocodiles on the Fishing for Crocs platform that follows each feed show. To help plan your day, see our daily schedule below.